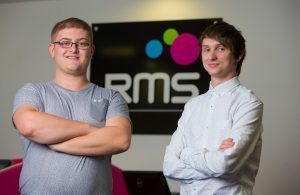 RMS PR has expanded its digital marketing and web development teams to cope with increased demand. Dave Bryan has joined as a digital marketing executive and will provide support on clients including Slater Heelis, Character World and Garratt Solicitors. And Scott Evans moves to the Altrincham-based agency as a senior web developer after working in-house at a large construction company. Agency MD Ruth Shearn said: “Demand for our web development and digital marketing services has increased significantly. I’m thrilled to have recruited yet more talented people to our growing team. “Dave has a really impressive track record for delivering highly effective digital marketing campaigns that deliver tangible results for clients, while Scott brings additional skills to our web team that mean we’ll be able to develop even more complex websites and bespoke applications." The new recruits are already working on a complete revamp of RMS's website.